As many have expected, Supergiant Games' Transistor, their second game after their fantastic Bastion, is equally as wonderful. The game brings all of the passion and class that its predecessor had, and then some. Having just finished my second playthrough, I still can't get this game out of my head. It really is a gem, and I believe it's worth pointing out the particulars of what it did so well, as well as some of the shortcomings that could be perceived. Spoilers for Transistor will be featured heavily throughout this piece. The character design in Transistor is simple and elegant. The protagonist Red is uncomplicated, with her most noticeable feature being her crimson red hair. This automatically makes her eye-catching to the player and it is near impossible to lose her in the city of Cloudbank. Another aspect about her design that really sticks out is the man's coat she starts wearing which immediately jumpstarts the relationship between Red and the man that inhabits the titular weapon. On that note, the design of the Transistor itself is something that's really captivating. It evokes imagery of a sword, while having patterns and symbols that would liken it to a USB stick or computer circuitry. The sky blue and deep red "eye" of the weapon really makes it pop, differencing itself from the more mute colors of the city the game takes place in. The Camerata on the other hand brings a certain elegance that screams character, despite the very limited dialogue they have. Relying on Function() descriptions to really flesh out who these villains are, each of the four have a distinct style that makes them charming in their own right, despite their limited screen time. Despite all of them featuring the red and white colors that The Process is known for, the one that really stuck out to me was the game's first boss, Sybil Reisz. The first thing I noticed when we were given a snapshot of her was her hat. The brooch on her hat looked remarkably like a Cell, which is somewhat entertaining given how her boss encounter plays out. The Process as a whole have a very clean and straightforward design, which is suiting when noticing what they're doing to the city. Two particular enemies, the Young Lady and the Bully stand out for perfecting the "less is more". Despite being relatively featureless, the Young Lady appears aptly named, meanwhile the Bully is a hulking, hyper aggressive enemy that refuses to back off. In my opinion, the gameplay is where Transistor really shines. Playing similarly to how Bastion did, there a few welcome upgrades that make every enemy encounter a joy to playthrough. The most noticeable of these is the addition of the Turn(). This mechanic features a bar that, once it loads, allows you to freeze time and plan out various actions expending the bar, then unpausing it and executing it. This adds a surprising amount of tactical depth to the game, and it's welcome given how relentless the enemies are. The skills themselves are all very different from one another, with Functions ranging from typical attacks and debuffs to a myriad of projectiles and Area-of-Effect abilities. With the game allowing you to equip Functions on to other functions, things get intriguing fast. Thousands of loadout possibilities are available come the end of the game, and as exciting as this, it also welcomes opportunities to utterly break the combat. Certain Function combinations are absolutely ridiculous, with some absolutely destroying every enemy encounter. Void(Purge+Get) combined with Cull(Ping+Get) will wreck any enemy in the game. There isn't anything outright wrong with that, games like Final Fantasy Tactics practically brag about how easy it is to break them. It's just a shame about how easy it is to remove the games challenge, but that's why there are the optional Limiters. Limiters are this games version of Bastion's Idols. Each Limiter added makes the game progressively harder, such as causing more enemies to spawn or increasing the penalty for losing all your health. When all ten are activated, every encounter will demand the player's absolute attention. In my opinion, the game should be played with most of, if not all of, the Limiters on at all times. It provides a lot of depth and planning to combat and most would agree it adds a lot of longevity to the game. Outside of combat, the gameplay consists of trekking from point A to point B in Cloudbank. There are some neat little things to see here and there with trivial stats about locations and items being given out for some laughs, and the OVC terminals offer a lot of backstory and character building. As beautiful as the cityscape and environments are though, I feel as if it painfully empty. Sure, the city is being ruined so I can understand why there wouldn't be a lot going on, it just feels needlessly dull. I'm not going to spend a lot of time on this one because it is widely agreed that the music for Transistor is phenomenal. Darren Korb knocked another ball out of the park, as did Ashley Barret returning for the vocal tracks. I have no doubt that people will be talking about the soundtrack, particularly "We All Become" for a very long time. It is worth a special note that the music being so tied to the game really makes the whole experience a lot more special and involving. This is reinforced by the aforementioned song, that actually tells somewhat a synopsis of the story of the game. The story of the game is not particularly complex. However, in a very Bastion fashion, the story is told through references and in bits and pieces. The overall plot of the game is laid out, but to gain a true understanding of what is actually transpiring, reading the descriptions for the Functions, as well as visiting the OVC terminals is necessary. The game doesn't tell a particularly complex story, but it's not hard to become infatuated with both Red and the spirit inside the Transistor. The little communication they have via terminals really brings Red to life. You sympathize for Red for having lost her voice, and again for the man inside the Transistor for not being able to communicate properly with her. One detail however was particularly frustrating. At roughly two thirds of the way through the game, you're led to a supposed encounter with two of the Camerata, namely Grant and Asher Kendrell. In the trailers leading up to the launch of the game, Grant was depicted at possibly being the "big bad", the lead villain of the game. However, when the player finds Asher and Grant, it is found that they both committed suicide. While I am not opposed to betraying player expectations, it is a shame that two potentially fascinating characters were disposed of in a nonchalant manner. While Asher did have some communication with Red, Grant didn't have a single word of dialogue throughout the entire game. While it is possible to find more information about him through side-reading in game, it feels like an awful waste of potential. This title only confirms a suspicion I had before. Supergiant Games will be known for their stylish games. This game oozes creativity, and it is found in all assets. The area design, the script, the lore, it all contributes to a concept that Transistor lays out. It delivers the promise of an interesting game.The computer science lingo found throughout amplifies the kind of technological place that Cloudbank is supposed to be. The people who pull the strings are Administrators, the tools to fight back are Functions, and the player a User. Even some of the Functions themselves have notable computer references, with Get() and Void() coming to mind. The commitment to show that the city was shaped by the people is impeccable, with many references to people voting on even the most simple things shown throughout. 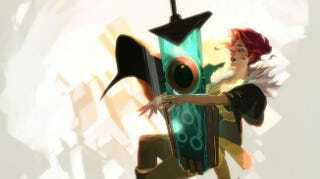 Above this however is Transistor to show of cool video game moments. By this, I mean the moments that you can only extract from the medium as a whole. Fighting a massive enemy such as The Spine isn't something that you could show just by reading or watching someone else do it. Instead the game displays how much of a threat this creature is by distorting the Transistor's personality and assaulting you. Before you initiate the fight, you can't even damage the beast. Then, on the final terminal before the boss fight, Red leaves a message. "I'm going to find whatever is doing this and I'm going to break its heart." Red doesn't disappoint. Going further than that is the game's final boss. Despite a lack of build up or explanation as to why the events are happening, he offers a simple phrase before the battle commences, "So, who gets to go first? How about… me." And with that, he proceeds to use all the same abilities Red has mastered throughout the course of the game. The Turn() system and all the various Functions are at his command. Dramatic boss battles are not something new to video games, but it's exciting to see what it's like on the receiving end when faced with an enemy that can do everything you can do. These spine-shivering moments are elusive, and I believe they're important in remembering the kind of experiences we can have with video games. Transistor is certainly something to behold. The game throws you in to the chaos. You watch the end as it happens around you, and you fight back as hard as you can. The Transistor will comment on your skill or brutality as you march towards your revenge. The design of the game gives you a canvas for your journey, and the gameplay is your brush. And no doubt you'll be humming the songs long after you've finished the game. Transistor is beautiful, and the journey is something you don't want to miss out on. Transistor was released on May 20th, 2014. It is available on Steam and Playstation 4.